IDW held their October press conference today providing more details on the two new Transformers ongoing series that will spin off from Chaos and Death of Optimus Prime stories. IDW had revealed these plans at Botcon but did not provide details on what the split books would focus on until now. Starting in January the current ongoing Transformers series will be replaced with Transformers: More Than Meets the Eye and Transformers: Robots in Disguise. MTMTE will be written by James Roberts with art from Nick Roche. RID will be written by John Barber and art from Andrew Griffith. Each series focus on one side of a philosophical divide that arises within the Autobots after they finally achieve victory in the Cybertronian civil war. 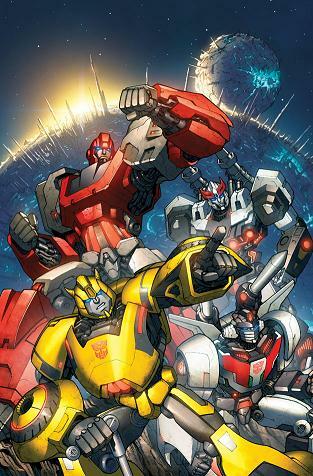 - Rodimus leads group of Transformers on quest in space to find the Knights of Cybertron. - Knights legends suggest lost tribe can restore Cybertron back to its Golden Age. - In part series will explore why some characters chose to follow Rodimus in search of the Knights. Not all necessarily even believe in the legend. - Like any quest, danger is found everywhere while at the same time they must deal with consequences of a war that spread throughout the galaxy over the course of millions of years. - Focuses on the rebuilding of Cybertron with Bumblebee as leader. - Has to figure out how to rebuild Cybertron, deal with remaining Decepticons, and the influx of thousands of Transformers who opted out of the war. - Both series will have returning characters, those not seen in a while or just not used. - Example: Metalhawk, the leader of the Autobot Pretenders, returns. He was last seen in Drift #1. No info on which series he will appear in. - On Decepticon side, Starscream and Cyclonus will play a role in events, again no mention on which title. - No mention of Galvatron or Megatron. - Full covers can be found here.